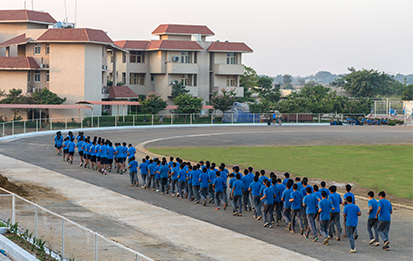 The school has 2 NCC wings the Girls Air Wing (Junior) and Boys Air Wing (Junior) both have a strength of 50 each and regularly participate in various NCC Camps and are trained by deputed personnel from the NCC on a weekly basis. Students of Grade XI & XII have the chance to be part of The National Service Scheme run under the aegis of Ministry of Youth Affairs & Sports Govt. of India. The school unit organise a yearly 10 day camp at a nearby village and help the local villagers by organizing blood camps, eye check-ups and raising awareness about the importance of cleanliness and safe drinking water. It is a great platform for students to interact with people from an agrarian background and help understand the issues they face.